So now it’s 2011. I received my first CI in April 2009 and the second in late December 09 – so I’m officially over a year being bilateral. It’s been great. Life is good and pretty much what I’d call normal. I can hear a lot better in many situations. I find myself having one-on-one conversations in very noisy places (a Wine Guild holiday party with about 80 people in a small space – Don had a headache when we left from the noise!). I still participate a lot more if someone’s talking to ME specifically. One-on-one conversation guarantees this, but I’m finding that it happens more often now as a side conversation than it used to. For example, at lunch with a group of five people, I can switch between the main conversation and talking to someone next to me and usually not be too lost when I go back to the group. I catch enough so that I can be filled in with a quick ‘what was that?’ or ‘who were you talking about?’ It used to be a lot harder to catch up to a conversation like that. I’m still playing in the 90-piece concert band and the 6-member saxophone ensemble. It took a few CI mappings before the trumpets playing too loud stopped making my face twitch from the first CI. Speaking of mappings, I haven’t been to UNC for an appointment since last year, I think mid or late March. I could probably use one, but don’t have anything specific that needs tweaking. Another thing that’s amazingly easier than it used to be: having a conversation in the car in the dark. At least with Don, I don’t get many opportunities to test this with other people. So all is going really well, and there’s generally not a lot that seems exciting enough to bother blogging about. That’s a pretty good testimonial! 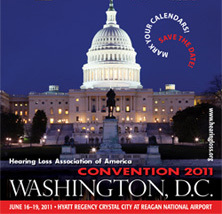 I just saw that the HLAA convention is in Washington, DC this year. I’ve never been but it always seemed interesting, so I’m going to plan to attend since I’m only 2 hours away. (I used to work in Crystal City and we always walked for coffee at the Starbucks in the Hyatt that’s hosting the conference.) I know it’s way out in June, but let me know if you’re going. That’s great that everything is working out for you. My background is very similar to yours and I hope things work out as great for me. I was activated just about 3 weeks ago, it’s had ups and downs. Some times I feel a bit discouraged because I’m not making progress. I was wanting to go bilateral if everything went well after 6 months, but I’m really worried about losing the deep bass that my unimplanted ear hears. I read that you have hybrid implants, how does the bass feel to you? Does it feel more like your ear is taking care of it or the CI?